Every tailgater has a favorite tradition. Whether that tradition occurs in the parking lot of a storied baseball park or in the shadow of a sold-out football stadium (or even in your backyard! ), it invariably involves live fire cooking. The grill or smoker you use plays a central role in these celebrations, with mouth watering output ranging from grilled corn to chicken wings and even a bratwurst hot tub. This fall, we’re helping you discover new recipes and mix up your tailgating traditions with new equipment that will step up your game. 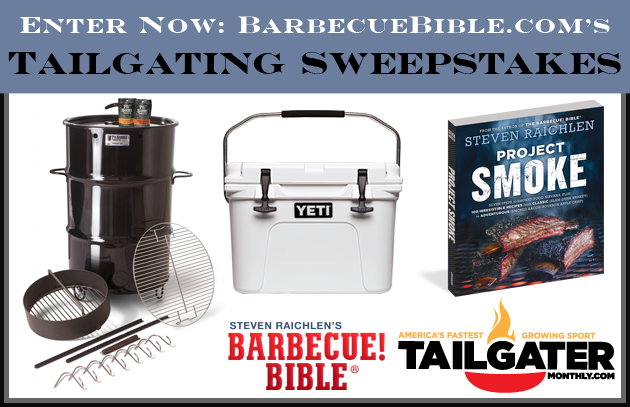 • And be sure to sign up for your FREE digital issue of Tailgater Magazine in the entry form for tailgating tips and recipes! Use your email address or log in with Facebook to complete your entry. NO PURCHASE NECESSARY. Open to US residents of the 48 Continental United States, age 18 years as of October 15, 2017. Sweepstakes begins at 12:00 a.m. Eastern Time (ET) on 9/15/2017 and ends at 11:59 p.m. ET on 10/15/2017. Click here for official rules. Void where prohibited. More recipes are available in the $3.99 ebook, Raichlen’s Tailgating, available wherever ebooks are sold.